The company was founded in 1997in Liège, Belgium. 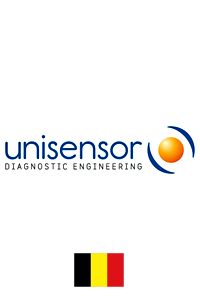 The initial objective was to achieve an ambitious research program involving the most prestigious laboratories and industrial experts towards a common goal to better serve the food industry for control and safety.Unisensor SA is currently active worldwide in agrofood Diagnostic Engineering and in particular in Food Safety Diagnostic.The main technology on which the entire products range is currently based is Lateral Flow Devices. Indeed, all the tests proposed by the company are dipstick tests targeting adulterants or contaminants (antibiotics, mycotoxins) in different commodities. Aside dipsticks development, our R&D department is working on the extension of the number of targets analyzed on a single run but also on other sensing plate-forms aiming at the automatic multiplex detection of contaminants in milk and meat in addition of simpler methods reducing the intervention of the end-user in the test run. Thanks to its expertise acquired along with the different European projects (Good Food (FP6), CONffIDENCE (FP7), Go with the Flow (EUROSTARS)), Unisensor SA was able to extent its products portfolio and acquired new competences on fields where the company had only few experience. This is especially true for the EUROSTARS project involving Flow cytometry and for the CONffIDENCEproject with mycotoxins. For the later, the 4-Mycosensor was developed in the framework of the project. At the end of the research program, Unisensor SA went on with the developments to propose now more than 6 different products for mycotoxins detection. Our objective in such kind of research is to transform the results of the research into a final product to make it available for the largest audience. The Unisensor SA’s team tells, to date, approximately 45 people that are in frequent contact with all our international distributors network present in more than 50 countries, where Europe, China, Middle East and South America are the principal places. At end of March 2015 the financial turnover was 14 M€.